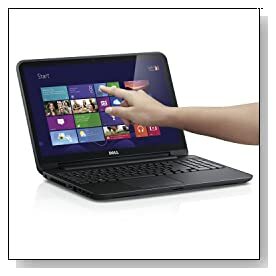 The new Dell Inspiron 15 i15RVT-13287BLK comes with great features at a reasonable price, for you to be able to work on your everyday tasks comfortably. It has a touchscreen, a slim modern design, a large memory and a 4th generation processor for performance and energy efficiency. Haswell Intel Core i5-4200U processor at 1.6 GHz speed (3M Cache), 6GB 2 DIMM (1x2GB+1x4GB) DDR3L at 1600Mhz and 500 GB SATA 5400 RPM hard drive .. It is the latest processor that also happens to be the fastest and most powerful. 6 GB RAM is plenty for running a few programs at the same time smoothly. 500 GB is more than sufficient space for most computer users to store all their files. Operating system is the Windows 8 and you can install the newer 8.1 on the Microsoft store without having to pay. You'll get used to the Win 8 in no time as this is a touchscreen computer. It is actually quite user friendly with its customizable tiles and you get the added advantage of being able to sync your files and photos to the web based cloud to access on whichever device wherever. 15.6-Inch HD LED Backlit Touchscreen Display with Truelife and 1366 x 768 pixel resolution and Intel HD Graphics 4400. Picture quality is really good with vivid colors and clear images for playing games and movies or browsing the net. Having the highly responsive touchscreen is a great advantage and you'll like using it with the Windows 8 and 8.1. Also cool sound through the built-in speakers and Waves Maxx Audio 4.0. 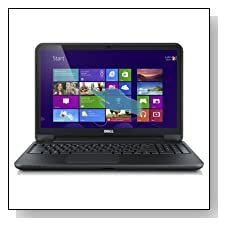 Modern and stylish black matte with textured finish Dell Inspiron is only 1 inch thin, so it is quite slim and portable. It has a full keyboard with a 10-key numeric pad to make data entry simple. And comes with useful connectivity options like 2 x USB 2.0 Ports, 2 x USB 3.0 Ports, Tray load DVD Drive (Reads and Writes to DVD/CD), 8-in-1 Media Card Reader, Bluetooth tied to wireless card and 802.11bgn wireless. Conclusion: Dell Inspiron 15 i15RVT-13287BLK is one of the best Haswell Intel i5 laptops you can get at this price range. Video and audio quality, soft keyboard, responsive touchpad, intuitive touchscreen, large memory for multitasking and solid build to make it last for quite some time.. It is great to use for school assignments, work presentations or home entertainment. Highly recommended!